Historically the concrete pumping business has shunned frills. “Concrete workers have no need for a pretty truck or chrome wheels,” Craiglow says. 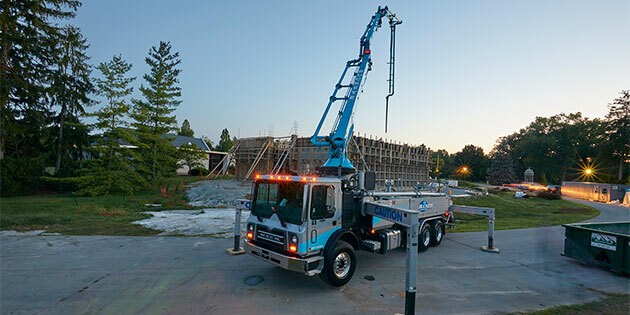 But contractors “realize their trucks are their calling cards and they need to present a good image with a modern truck.” Even with this shift in attitude, the demand for trucks that are tough and dependable is unchanging, especially given the high and rising cost of ­downtime. Buckeye operates a fleet of Mack® TerraPro™ cabovers outfitted with Schwing pumps of varying lengths. All of Buckeye’s Macks are equipped with proven MP®7 or MP®8 engines ranging from 375 to 425 horsepower. As with all Mack engines, output is enhanced by broad power and torque curves, making more power available at a wider range of engine speeds. Buckeye opts for the Maxidyne® offering, which provides extended RPM ranges and high torque rise for off-road and jobsite use. Historically Buckeye has used the Mack T300 manual transmissions, but the company is starting to spec the Mack mDRIVE™ HD automated manual transmission. In addition to equipping their largest units (those with booms more than 40 meters long), Buckeye is also ordering mDRIVE for trucks with shorter booms. Another valuable powertrain feature for Buckeye is Mack’s automatic power divider, which delivers up to 75 percent of drive power to the wheels with traction, a huge help on muddy jobsites. The TerraPro chassis can be configured with multiple steer and drive axle combinations. This make the TerraPro an ideal platform for Buckeye’s pumps of any length. Some of the company’s TerraPro models have a total of 6 or 8 axles. Buckeye Concrete Pumping had very modest origins: “One pump and me,” Craiglow says. He had a facility where he kept the truck at night “and I slept on a cot next to it.” Since Buckeye started in 1985 the company has had steady growth and now has annual revenue of $4 million with 16 employees and 17 concrete pumping units. Growth was helped by the broader acceptance of concrete pumping. It used to be employed only in specialized jobs, but now it has wider application as a mainstream construction practice for commercial and residential jobs, plus infrastructure like roads and bridges. The general economy is strong and the construction economy is booming. Among the hot spots in construction are healthcare facilities. “It seems like they’re building an urgent care center everywhere there’s an exit,” says Craiglow. He expects continued growth for Buckeye: “I see new names on our work orders nearly every day.” That growth will continue despite increased competition because Craiglow has refined his business strategies accordingly. Having the right employees is part of Buckeye’s success, but Craiglow says ­attracting and retaining quality employees is a huge challenge these days, as it is for nearly every ­business.